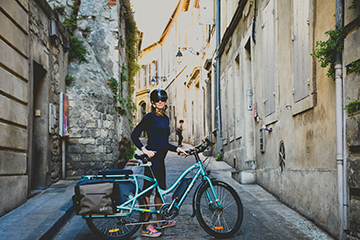 Give the gift of a healthier lifestyle and a more adventurous mode of transportation this year from Yuba Bikes, cargo bikes made to make everyday errands more fun. Carry kids, groceries, pets, enough space to even include the kitchen sink. Yuba Bikes are specially welded to be safer and sturdier than others, which is important when precious cargo such as kids are on board. I had a chance to interview to learn more. What sets Yuba bikes apart? Yuba Bikes stand apart from competitors because of the quality of materials they use and the design of their bikes. They specifically design frames to be sturdy and safe, which is important when the bike is being used to carry heavy loads or precious cargo like kiddos. Things such as a smaller wheel base on some models (ie: the Spicy Curry rear wheel is smaller to maintain a lower center of gravity for more stability). Yuba Bikes also welds their bike frames together, which improves the longevity of them and makes them less susceptible to parts becoming loose. How can these bikes actually save families money? Yuba Bikes are utilitarian for families and individuals. They allow people to use bikes in ways people use cars. The hope is that if more people start using these bikes, there is less of a demand to use cars for basic errands. Thus, if people can spend more time on a bike, they're saving on gas, maybe they end up selling the second car because the bike is so often used :) Plus, the bikes are great alternatives for teens to use before they have their license to get around or even once they do have it as an alternative car. What are some of the most family-friendly options? They are all family friendly options, but it depends on lifestyle. The Electric Supermarche is the truck/suv of the bike path. It has a front loading cargo space which is easy to drop bags of groceries in along with kids, pets etc. The Electric Boda Boda is another great option and has the rear cargo style. It has more of a compact frame and is great for riding with kids on the back (even an adult! ).